Chris Dowd and the CD Racing team hoist William Dunlop aloft after he won the second Supersport race at the Ulster Grand Prix in 2009 - his first four-stroke success at one of road racing's 'majors'. Chris Dowd always knew when William Dunlop would prove unbeatable on his Yamaha R6. The Randalstown team owner played an instrumental role in William’s career, first becoming involved with the Ballymoney man following his father Robert’s death at the North West 200 in 2008. Over the next eight years, Dowd’s CD Racing team and Dunlop were inextricably linked and William clinched a breakthrough international win in the second Supersport race at the Ulster Grand Prix in 2009 on Dowd’s 600 Yamaha – his first four-stroke win at one of road racing’s three majors. 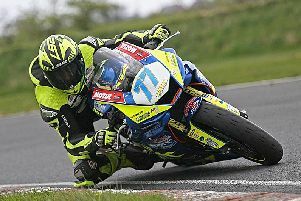 On Sunday, Dowd – who parted company with William before the 2016 North West 200 – told the News Letter that William was unbeatable on his day when ‘everything was right’. “William needed everything to be right – he needed the whole package to click,” he said. “But when it did, when he believed in the bike, he knew he would win. His dad used to have a wee saying, ‘they’ve got no chance’. Dowd, a former racer himself, split from William before the 2016 North West, but says the pair always parted on amicable terms. “When we parted before the North West it wasn’t William’s fault,” he said. “There were other factors involved but I bore him no ill-will. We had a relationship where I always told him if he wanted to go elsewhere, to take his opportunity, but if things didn’t work out then he knew he could come back to me. “When I heard the news on Saturday I felt sickened. I had lifted the phone to ring him last week but got distracted and never made the call – I really wish I had now. TAS Racing team principal Philip Neill also paid tribute to William, who rode for his team between 2014 and 2016, and said he would remember the ‘happy times’. “We enjoyed some great times with William and some notable success during that period. Those happy memories will remain with us forever.